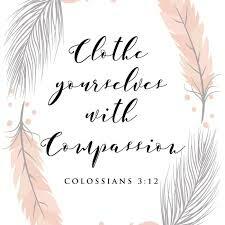 Every time we treat others with compassion and kindness, we reflect Him a little better and our joy deepens. When we choose to deal with people with humility, gentleness and patience, others get a glimpse of Jesus. It is Christ and Christ alone who can transform lives, but we can be the “set-up” people, making hearts tender and open to hearing the Gospel. I’m looking forward to a summer of growth and fruitfulness as we learn to “get dressed” God’s way!